SQL Server 2016 first public preview now available! Three weeks ago at Microsoft Ignite, we announced SQL Server 2016, the next major release of Microsoft’s flagship database and analytics platform, as well key innovations in the release. Today we are pleased to announce the first public Community Technology Preview (CTP2) for SQL Server 2016. This public preview gives an early look into many of the capabilities in the release and allows early adopters to get engaged by testing the preview in their environments or via a virtual machine in Microsoft Azure. SQL Server 2016 provides breakthrough performance for mission critical applications and deeper insights on your data across on-premises and cloud. Top capabilities for the release include: Always Encrypted – a new capability that protects data at rest and in motion, Stretch Database – new technology that lets you dynamically stretch your warm and cold transactional data to Microsoft Azure, enhancements to our industry-leading in-memory technologies for real-time analytics on top of breakthrough transactional performance and new in-database analytics with R integration. Ongoing preview updates – Coming soon! New with SQL Server 2016, customers will have the opportunity to receive more frequent updates to their preview to help accelerate internal development and test efforts. Instead of waiting for CTP3, customers can choose to download periodic updates to CTP2 gaining access to new capabilities and features as soon as they are available for testing. More details will be shared when the first preview update is available. Download SQL Server 2016 preview today! Now that you have seen the many exciting capabilities included in SQL Server 2016 CTP2, be sure to download the preview or trial the preview using a virtual machine in Microsoft Azure and start evaluating the impact these new innovations can have for your business. Also, be sure to share your feedback on the new SQL Server 2016 capabilities using Microsoft’s Connect tool. As the foundation of our end-to-end data platform, with this release we continue to make it easier for customers to maximize their data dividends. With SQL Server 2016 you can capture, transform, and analyze any data, of any size, at any scale, in its native format —using the tools, languages and frameworks you know and want in a trusted environment on-premises and in the cloud. 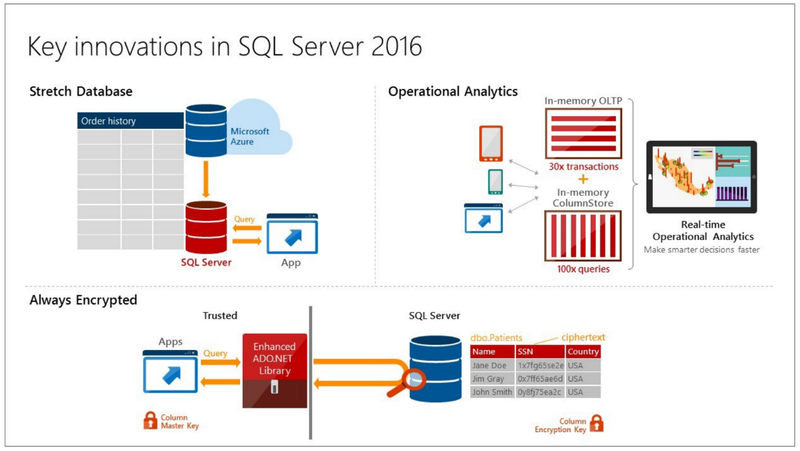 To learn more about the release, visit the SQL Server 2016 preview page. We look forward to hearing from you!